The European Union (EU) maintains that the word “Prosecco” is a geographical indication for a type of wine made in northern Italy, rather than a grape variety. This position has been relied on by the EU to ban the importation of any wine labelled as Prosecco into the EU, and into other countries with which the EU has free trade agreements. Moreover, the EU is demanding that Australian wine producers be prohibited from marketing wine labelled Prosecco in Australia, as a condition of its entry into a bilateral trade agreement. Based on a detailed historical analysis of the use of the term Prosecco in Italy, this article argues that the EU’s characterisation of the term is erroneous and is intended to operate to protect Italian Prosecco producers from international competition. By implication, the EU regulation is likely to contravene Art 20 of the World Trade Organization’s Trade Related Aspects of Intellectual Property Agreement (which prohibits governments from unjustifiably encumbering the use of trademarks) and Art 2.1 of the Agreement on Technical Barriers to Trade (which prohibits, inter alia, technical regulations pertaining to terminology and labelling that unjustifiably discriminate between similar domestic and imported products). Furthermore, a prohibition on the use of the word Prosecco on Australian products in the Australian market may be inconsistent with the Australian Constitution, which prohibits the acquisition of property by government on other than just terms. These issues also point to a more fundamental question: namely, whether and if so to what extent domestic legal systems may permissibly be used to generate claims to intellectual property that are then used to leverage international protection for that intellectual property. This is the second of a two-part article series which analyses the current laws and regulations in Australia that apply to the usage of Australian regional names on food labels to make origin claims. The first article in the series explained the deficiencies of current Australian consumer protection and passing off laws. This article summarises the main deficiencies that exist with Australian trade mark laws, before providing a summary of the main deficiencies identified with consumer protection laws, passing off and trade mark laws. Furthermore, this article identifies four main problems that result from the deficiencies with these current laws. It identifies that the main deficiency of these laws is that none of them adequately regulate whether there is a connection between food and origin before food producers and traders can use Australian regional names on food labels to make an origin claim. Consequently, the article highlights that these laws allow food producers and traders to use Australian regional names on food labels in a way that falls short of being misleading or deceptive or involving passing off, even though their food products do not have a clear or strong connection with the region named on their food label. This article explains that food producers who use Australian regional names on food labels in this way are taking advantage of, and free-riding on, the reputation that Australian regions have for producing authentic quality regional food and the value that accordingly exists in Australian regional names. It explains and justifies a potential solution to the deficiencies that have been identified with Australia’s law by proposing a legal framework be implemented that is dedicated to identifying and protecting the connection between food and origin. This article explains and analyses the Australian wine Geographical Indications (GI) system, which may serve as a model for a proposed food GI law. It examines the lessons that can be learnt for food GI from the Australian wine GI system, and proposes improvements to the wine GI system by introducing a “second tier” of GI protection. As a whole, the series of articles recommends that a sui generis food GI system would be the ideal legal framework to implement in Australia to identify and protect the connection between food and origin, drawing on some features of the Australian wine GI system, but being more prescriptive than the Australian wine GI system, so as to provide for a “true GI” system in relation to food products. This article explains that the implementation of a food GI framework is important for Australia not only at a national level, but also at an international level given that food GIs have become a major trading issue. This is particularly relevant given Australia’s recent commencement of negotiations with the European Union in relation to the Australia-European Union Free Trade Agreement. 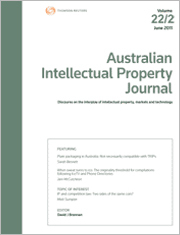 For the PDF version of the table of contents, click here: AIPJ Vol 29 No 3 Contents.